For most visitors to the Kingdom of Cambodia, a visa is obtainable upon arrival at either airport in Phnom Penh or Siem Reap. Crossing over from Thailand by land, visas are available at Poipet Banteay Meanchey and Cham Yeam (Koh Kong province). Visitors entering Cambodia from Vietnam by land through Bavet / Moc Bai, or Ka-Om Samnor / Chau Doc, will need to have already obtained their visas prior to their arrival through a Cambodian Embassy or Consulate overseas. Tourists can also obtain their visas through the online E-Visa. 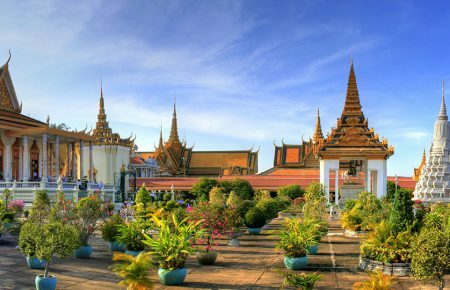 Regardless of the method of entry, a Cambodian tourist visa is valid for one month. Note: your passport must be valid for 6 months beyond your travel date, and there must be several blank pages left on your passport. You should also have a 5 cm x 5 cm on a white or off-white background photo ready, as well as USD$30 for the stamping fee. FYI, a departure tax is charged on all domestic and international flights.